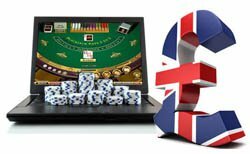 In a recent report by the to the UK Gambling Commission the gambling participation in the United Kingdom decreased by 2% in 2013. The study was called "Gambling participation: activities and mode of access" and the commission reported that 55% of the people that took part in the survey had wagered real money, in one form or another, in the last 4 weeks. This figure was down from the year before in 2012 when the number was 57%. Bettors in the United Kingdom were likely to have bet real money at least one time per month less than one week while many of the people in the survey said they were active on a weekly basis. It was also found in the report that more men than woman had gambled with 60% of men stating they were active in the previous month as opposed to 50% of the women surveyed. While the gambling in the UK overall had dropped 2% from the previous year online gambling continued to grow. 15% of those in the report said they had wagered online in the previous month when the number was 14% in 2012. The National Lottery, which saw its popularity grow in 2013 over the previous year, was excluded. While the National Lottery remained the most popular type of gambling in 2013 in the UK with 43% of people in the survey taking part, which was down from 43% in 2012. Betting online was more popular with men than women (19% to 11%) according to the survey in those who had bet over the Internet in the previous 4 weeks. Even though online gambling is growing in popularity the report that showed that most of the people had only played at a land based casino, ie in person-betting. However, the report showed that people that only took part on all individual activities were more likely to have placed wagers on the internet than both online and in person, but the exception being for horse racing and dog racing.